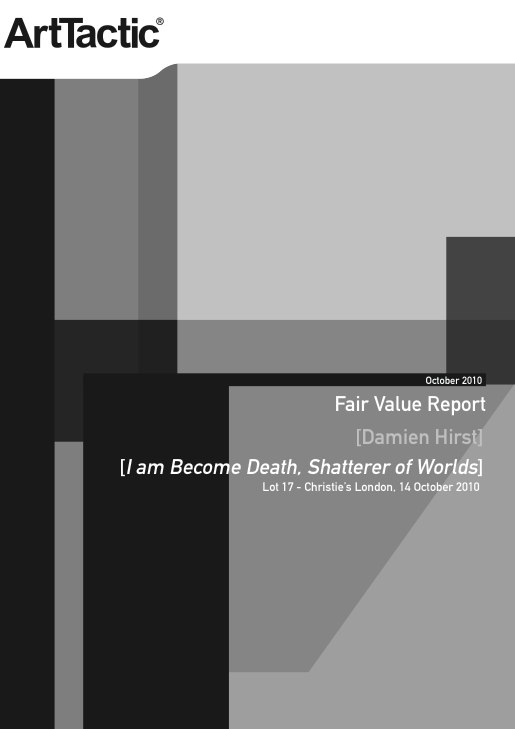 ArtTactic has launched its first Fair Value report on one of Damien Hirst’s largest butterfly paintings, titled ‘I am Become Death, Shatterer of Worlds (2006)’ appearing at Christie’s in London on the 14 October 2010. Christie’s has placed a pre-sale estimate on the work from £2,500,000 to £3,500,000. In pound sterling terms, this is exactly the same range that Phillips placed on similar work, ‘Eternity’ in 2007. If the work was to sell within the pre-sale estimate, it will become the second highest auction price for a Hirst painting.